(2015). The Influence of Fiber Crimp on Acoustic Performance of Polypropylene Fibrous Batt. Journal of Textiles and Polymers, 3(2), 71-75.
. "The Influence of Fiber Crimp on Acoustic Performance of Polypropylene Fibrous Batt". Journal of Textiles and Polymers, 3, 2, 2015, 71-75. (2015). 'The Influence of Fiber Crimp on Acoustic Performance of Polypropylene Fibrous Batt', Journal of Textiles and Polymers, 3(2), pp. 71-75. The Influence of Fiber Crimp on Acoustic Performance of Polypropylene Fibrous Batt. 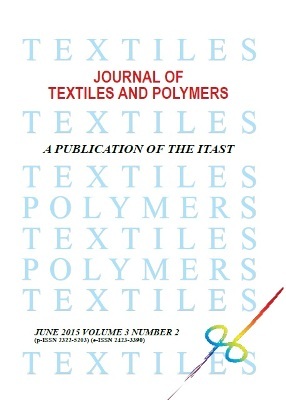 Journal of Textiles and Polymers, 2015; 3(2): 71-75. This paper reports on the effect of fiber crimp frequency on sound absorption capability of staple polypropylene nonwoven batts. Stuffer box was used to impart crimp to spun tow. Crimping of the tow renders the fibers the required textile applicability. In this work, polypropylene batts composed of staple fibers with linear densities of 9, 14, and 18 denier were employed. Three crimp frequency namely low, medium and high were imparted to fibers of each denier group. Impedance tube method with sound frequencies in the range of 250 – 4000 Hz was employed to measure the sound absorption coefficient of the batts. The results showed sound absorption properties of fibrous batts were affected by fiber crimp frequency, fiber fineness and web thickness. The highest sound absorption coefficient for the 9, 14 and 18 denier batts was 78.90, 77.14 and 71.18, respectively. The crimp frequency of the fibers making these batts was 1.9, 2.3 and 3.6 crimp per cm, respectively. It was found that higher crimp frequency along the fibers of the batts lead to higher sound absorption capacity. Finally, the highest sound absorption coefficient was recorded for the web with finest fibers and highest crimp frequency.